Listed as Critically Endangered on the IUCN Red List. Found from Senegal, Gambia and Mali in the west, throughout the Sahel region to Ethiopia and Somalia in the east; throughout East Africa from Ethiopia south to Mozambique; and in parts of Zambia, Zimbabwe, Botswana, South Africa, Namibia, and Angola. Open wooded savannah, particularly areas with Acacia. 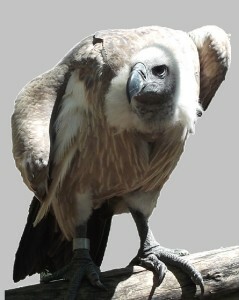 White-backed vultures are usually found in areas with game animals and livestock. They can be found at elevations up to 10,000 feet. Tall trees are required for nesting. White-backed vultures are scavengers that feed on the soft muscle, organ tissue, and bone fragments of large animal carcasses.